Fitbit Ionic: adidas edition smartwatch signature two toned ink blue and ice grey. 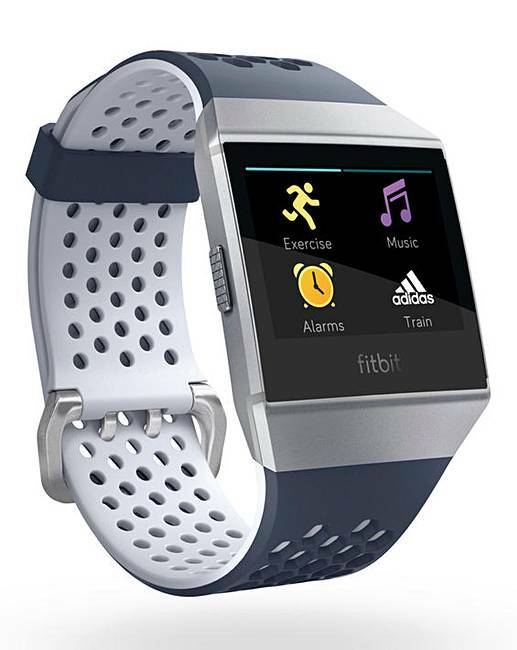 Includes a unique adidas coaching experience, signature band, exclusive clock face and more. Access instant motivation with exclusive adidas on-screen workouts. Train to be a better runner with unique adidas on-screen workouts designed to improve your form, power and speed. Also wallet free payments and notifications with quick replies. The ionic stores and plays 300+ songs. Intelligent frame, which is nano-molded unibody packs 8 different sensors in one watch. Premium materials, strong & light weight 6000 series aerospace-grade aluminum. Tracks steps, distance, calories, heart rate and sleep. Call notifications with caller ID, text notifications, email notifications, calendar alerts. Compatible with fitbit ionic syncs automatically and wirelessly to computers and 200+ leading iOS, android & windows devices using Bluetooth le wireless technology. Connects via Bluetooth and NFC. Water resistant up to 50m. 120 hours battery life from a 2 hour charge.